^ Faraday, Michael (1844). Experimental Researches in Electricity. 2. See plate 4. ^ Gee, William (2004). “Sturgeon, William (1783–1850)”. Oxford Dictionary of National Biography. Oxford, England: Oxford University Press. doi:10.1093/ref:odnb/26748. ^ Garrison, Ervan G., "A history of engineering and technology". CRC Press, 1998. ISBN 084939810X, 9780849398100. Retrieved May 7, 2009. Donald G. Fink and H. Wayne Beaty, Standard Handbook for Electrical Engineers, Eleventh Edition, McGraw-Hill, New York, 1978, ISBN 0-07-020974-X. Kuphaldt, Tony R. (2000-2006). “Chapter 13 AC MOTORS”. Lessons In Electric Circuits — Volume II. http://www.ibiblio.org/obp/electricCircuits/AC/AC_13.html 2006年4月11日閲覧。. Shanefield D. J., Industrial Electronics for Engineers, Chemists, and Technicians,William Andrew Publishing, Norwich, NY, 2001. Fitzgerald/Kingsley/Kusko (Fitzgerald/Kingsley/Umans in later years), Electric Machinery, classic text for junior and senior electrical engineering students. Originally published in 1952, 6th edition published in 2002. B. R. Pelly, "Thyristor Phase-Controlled Converters and Cycloconverters: Operation, Control, and Performance" (New York: John Wiley, 1971). John N. Chiasson, Modeling and High Performance Control of Electric Machines, Wiley-IEEE Press, New York, 2005, ISBN 0-471-68449-X. 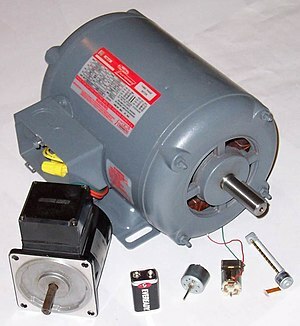 The Numbers Game: A Primer on Single-Phase A.C. Electric Motor Horsepower Ratings, Kevin S. Brady.